There is NO COUPON CODE, as I blogged about on Sunday. Want to purchase? Click BUY NOW, look at the top of the page and reclick Buy Now. Please note: I have NO business connection with the organization and get NO percentage of sale. This info is a follow up to my last blog about attempting to purchase the product a few days ago. Genealogy is all about patience and this purchase definitely reinforces that! 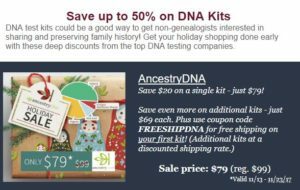 It’s that wonderful time of the year when the DNA companies promote their products with big savings knowing that the family get togethers will turn to great grandma’s emigration story and the question everyone wants answered – Where did we really come from? The problem is that when I hit “submit order” the lock moves over the words but doesn’t process. 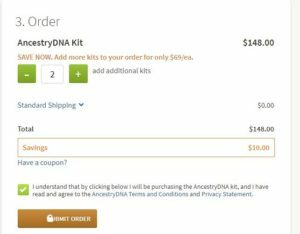 I hit the button twice and then, fearing I ordered 4 kits instead of 2, called Ancestry.com at 1-800-Ancestry. I spoke with Brittany who told me they had no record of the order. That was good in that I didn’t over order but since I wanted 2 kits, I still needed the order processed. I asked if they were having trouble with their website and she said no. Brittany tried and couldn’t get it to go through, either. She placed me on hold and sought out a supervisor. 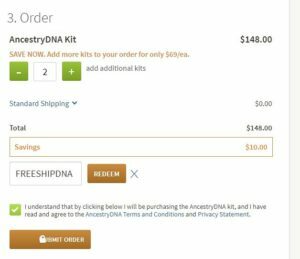 Brittany said that the system couldn’t calculate two discounts, meaning it could not take $10.00 off the second kit AND take off free shipping on Kit 1. I asked if this was because I was a returning customer and the offer was good for new customers only. She said no. I asked if there was an override. She said no and that the coupon code I was using had expired. I mentioned I had received the notice from several sources in the past few days and that the expiration date hadn’t occurred yet. I also told her exactly where I received the info but since I’m not trying to drag other organizations into this, I’m sure you’re understanding of why I’m not blogging my sources. Brittany told me the amount would be $162.00 but couldn’t explain how that amount was determined. If I ordered two kits at $79.00 with free shipping the amount would be $158.00; with $10.00 shipping on both kits it would be $178.00. If it was free shipping on the first kit and half on the second it would be $163.00. Maybe I should have just shut my mouth and taken the $162.00 offer but I don’t like paying for something when the price isn’t clear so I mentioned that there were competitors that were offering kits for less than the quoted amount. Now I know that the customer service person has no say in the price set and I’m sure she was rolling her eyes at this cheap customer but I figure if enough people speak out then maybe the powers to be will get the website working correctly to accept the offer. If the offer isn’t valid, then they need to just say that the other organizations made up the deal but I really don’t think that was the case since I got it from several sources. We hung up without my placing an order. But it, too, doesn’t allow me to purchase. The promotion at Amazon is $79.00 for each kit. 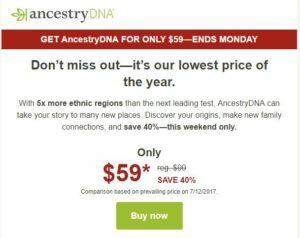 Better than the Ancestry.com offer but not as good as I wanted. I’ll let you know next week what I decide to do – I’ve wasted way too much time on this today! My Turkey Day shopping is waiting for me. Have a wonderful Thanksgiving! In June, I blogged about some of my genealogy finds when we cleaned out our garage – 2 mahogany chairs in particular. The initial estimates I got to refinish the chairs were $500.00 each and the price quoted for the upholstery was $500.00-$800.00 per chair, not including material of which two upholsterers estimated I would need 10 yards. So, it would have cost me over $2000.00 to have both chairs in usable condition. Yes, they have been in the family since about 1880 but we thought that the quotes were way too much. 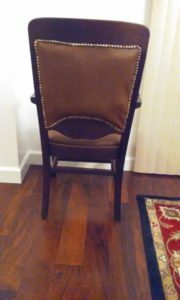 I eventually found someone to refinish the chairs for $125.00 each but I had to do touch up and pull out the old tacks. Hubby had to glue the leg support as the man “forgot” to do it. It took him over 6 weeks to do his magic so instead of leaving them for him to do correctly, I told him I’d finish it myself. I’m so glad I did as the hurricanes hit the following week and they were safer with us then in his flood prone neighborhood. I’m finally finished with upholstering and I think they came out wonderful, considering all I know about upholstery came from youtube videos and internet how-tos. I bought way too much material; I bought 8 but only used about 4 so it’ll be on Craig’s List this afternoon. I’d really like to know why both upholsterers who gave me estimates told me I needed 10 yards! When I recoop that excess, the cost to reupholster was about $50.00 per chair. 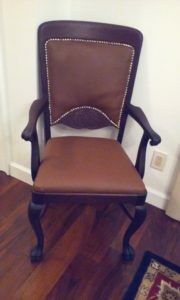 For $350.00, we’ve got 2 beautiful and comfortable antique chairs to enjoy the holidays. Best of all, hubby can finally cross this off his “To-Do” list. They’ve been on there for over 45 years – seriously!